Somehow along the journey of our Family Dinners, I decided that even if there’s more than one birthday for the month, each bday babe gets their own dessert. So when it was seester T and Nini’s bday, I found myself baking TWO cakes. Albeit, Nini’s was slightly larger and 15 pounds heavier. I’m royally screwed in July since there are FOUR BIRTHDAYS!! 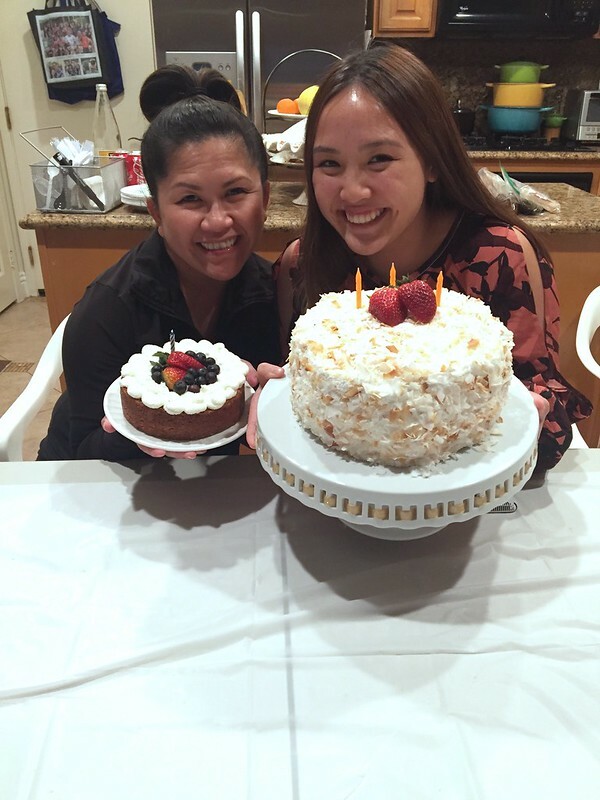 Why do I do this…..
Actually, our birthday gals were very low maintenance. They didn’t request anything over the top which made things quite easy for the other dishes. 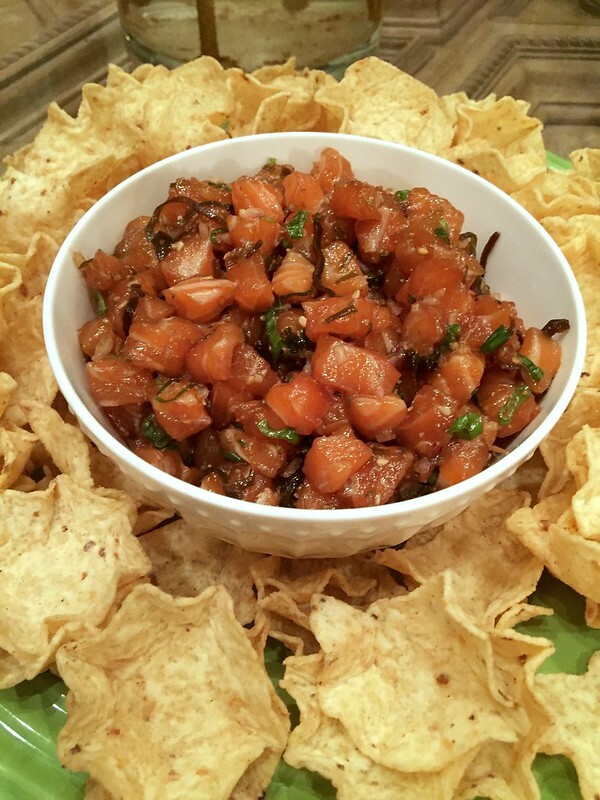 We opened up with fresh Salmon Shōyu Pokē and Chips — Nini’s choice. I have to admit, salmon generally isn’t my fish of choice. It’s fine but I think I went through a period where I was eating it all of the time and then one day….BLEH! NO MORE! Nowadays, I rarely order it when out and generally just prefer my salmon as lox over bagels. But when seestrah N whipped up this pokē, I was about it!! Fresh, slightly sweet and savory. She based it off my Ahi Shōyu Pokē that can be found here. As for the entrée, we went for the rich, stick to your ribs type of dish — as in short ribs!!! 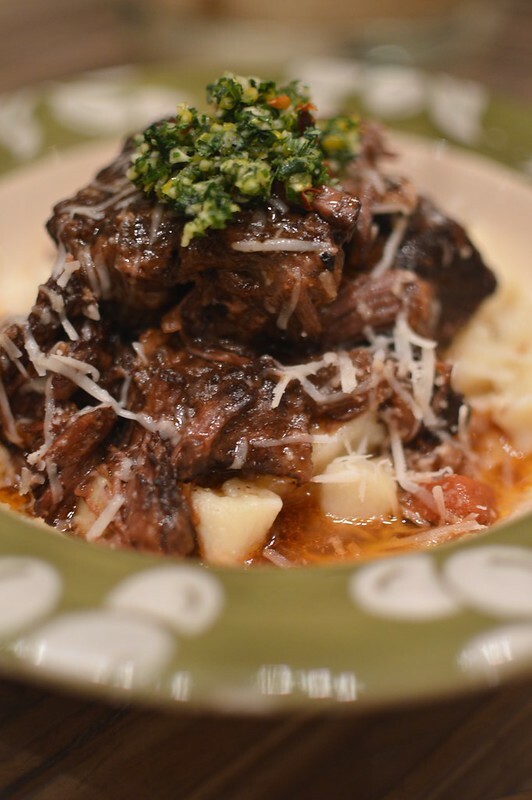 T made a GINORMOUS pot of Red Wine Braised Short Ribs that had tons of herbs, aromatics and ‘shrooms! I may or may not have stolen the below pic from her IG. Once the ribs were utterly tender and at the melt-in your mouth consistency, she shredded them and topped them over the freshly made Ricotta Gnocchi by brother V and my SIL L.
And since the beef was so rich, we added a big dollop of gremolata (garlic, lemon zest, and parsley) that our niece prepared. The gremolata adds a much needed freshness and bite to cut through all of that unctuous goodness. Then one of us (it sure wasn’t me!) 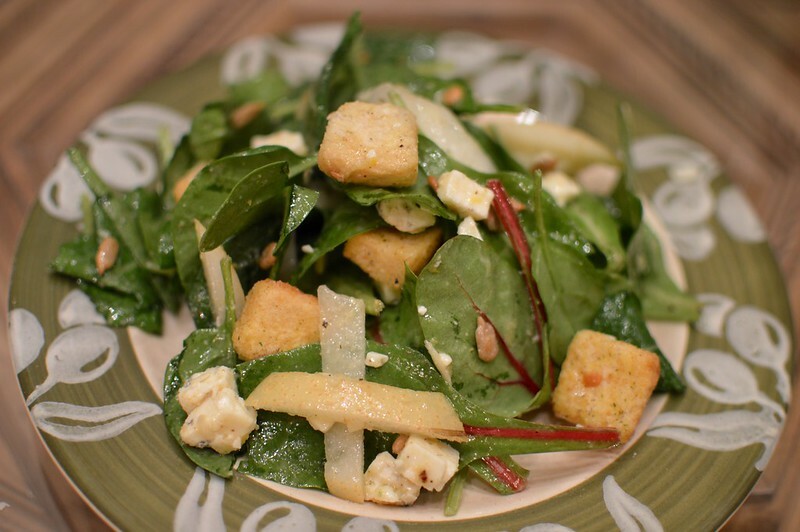 thought it would be a good idea to add some greens to the meal and pulled together a Gorgonzola and Asian Pear Salad. Don’t get me wrong, it was lovely but I would have been fine with just the greens from the gremolata! 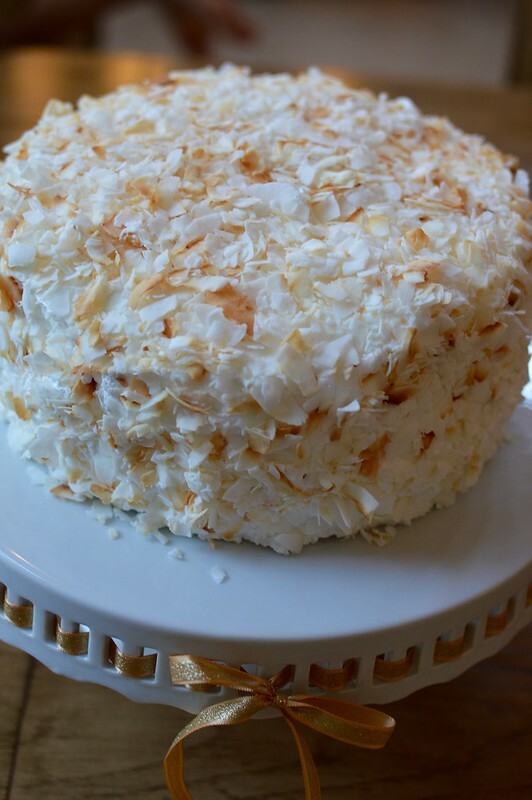 Nini requested a coconut cake. 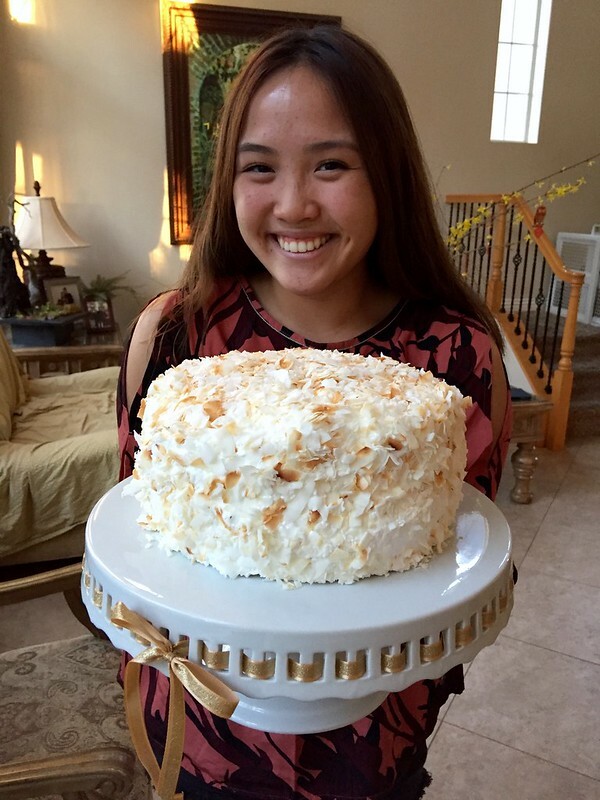 She asked and I delivered this three layered Toasted Coconut Cake. I used Thomas Keller’s recipe that can be found here. It’s a pretty standard southern coconut cake recipe that uses a combination of coconut milk, buttermilk and mayonnaise for a dense but moist cake crumb. 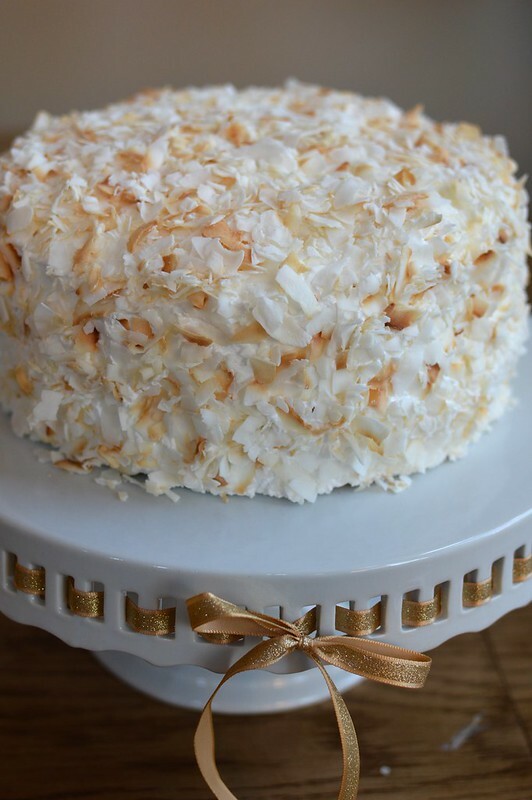 The cake is frosted in a thick Italian Meringue but instead of desiccated sweet coconut shreds, I covered it all in toasted coconut flakes so that it wouldn’t be too sweet. And I generally prefer the texture of the flakes over the shreds too. Nini was a fan. Success. Seeestrah is slightly obsessed with the Butter Cake from Mastro’s so I did my best to try and replicate it. 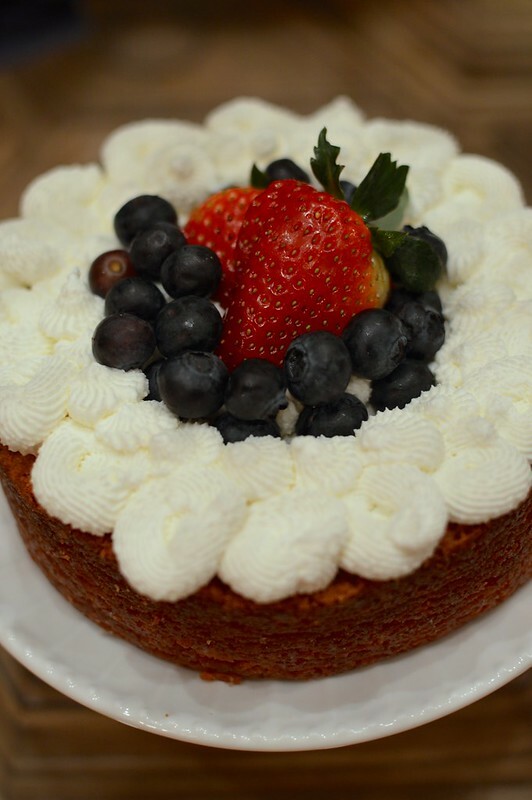 If you’ve never had the cake from Mastro’s, think of an incredibly rich and dense pound cake….but with more butter!!! After scouring the internet, I went with this recipe here. Truthfully, I had mediocre success with it and it took nearly twice as long for the cakes to bake. Not to mention we had a heck of a time removing it from the pans. But the flavor was pretty good and there’s nothing that a ton of fresh whipped cream and berries can’t hide—am I right? Sorry seester, I’ll definitely try again for ya…..
Needless to say, we all nearly knocked out after our heavy meal — but it was worth every calorie! I love reading about your Family Dinners! Both of those cakes sound fantastic.